Updated: Feb. 8, 12:45 p.m. | Posted: Feb. 6, 10 a.m. Photographer and filmmaker Gordon Parks overcame his difficult youth to have a celebrated career. Now the St. Paul gallery that bears Parks' name is showing the work of a young photographer who is following in his footsteps. It takes a little work to find Gordon Parks Gallery, located on the third floor of Metropolitan State University's Library and Learning Center in St. Paul. But it's worth the effort to visit this little jewel box of a space, and to see "In the Company of Others," the current show of photos by Den-Zell Gilliard. The exhibit features selections from different projects he's worked on over the past couple of years, including a series called "Sunday's Best." 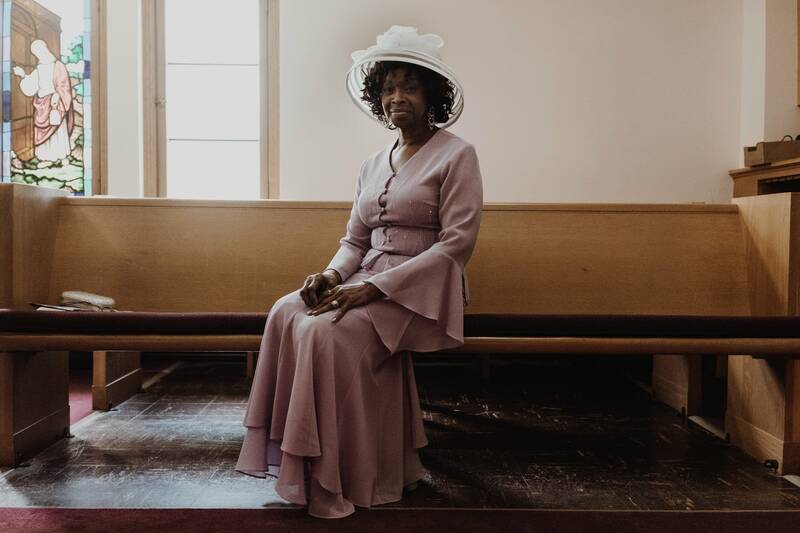 In one image, a poised woman in a beautiful mauve dress and white hat smiles kindly at the camera while sitting in a church pew. In another, a man kneels in prayer. 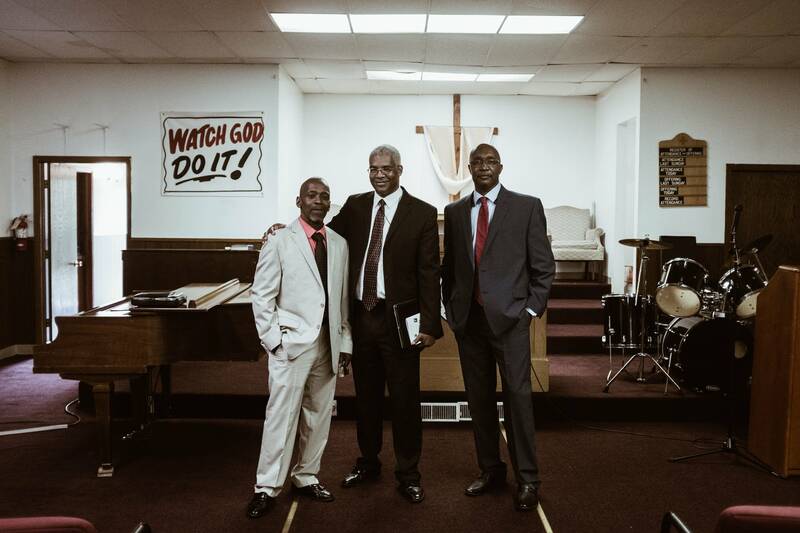 The photos were taken in several different churches in Gilliard's neighborhood in south Minneapolis. "I grew up southside Minneapolis," he said. 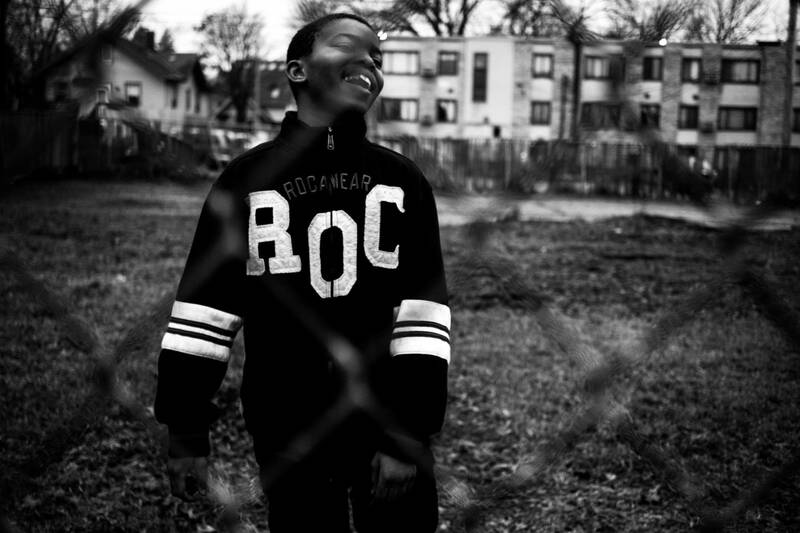 "I lived in the same spot that I live now, in the same home, a block away from my church." Gilliard grew up Baptist. "And that's what made it so beautiful," he said. "They felt comfortable with me because my grandfather was the preacher next door to all these churches." 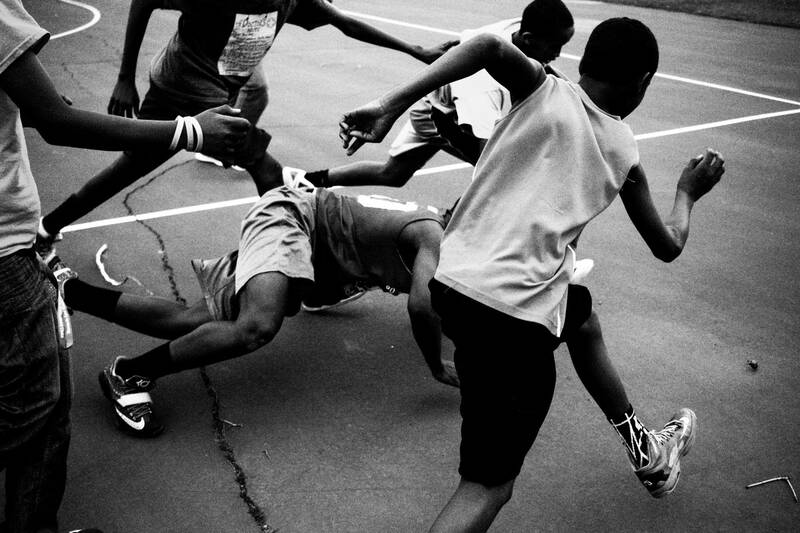 Another series in the exhibition is called "Odyssey of a Black Boy." In one photograph, a kid looks directly at the camera, biting his lip. It's cold out, and he doesn't have a hat or gloves. He wears a bright red sweatshirt with one word blazoned across his chest: "OBEY." Curator John Schuerman said that's his favorite photo in the show. "You can feel this youth with his back up against the wall," he said. "Without a lot of good options. And you just hope that he figures it out." Schuerman, like Gilliard, lives in south Minneapolis. But he said Gilliard's photographs are a window onto a world he doesn't get to see. "He's able to put his subjects at ease and respond in a way that really feels natural, almost as if the camera isn't there," he said. "It's actual life, and I think that comes through when the photographer is a participating member of the community rather than somebody who comes in from the outside." Gilliard, 27, originally went to school for law enforcement, but dropped out to pursue a career in photography instead. Gilliard said photography became a passion in high school, when he learned to develop film. "I think photography's in my roots, I think photography's in my blood," he said. "Photography started back ... when I was adopted by my mother. She always had a Polaroid camera, and I started shooting — just everyday, everyday, everyday things. Just simple things. The mundane." One of his favorite books is Gordon Parks' memoir "A Choice of Weapons." Parks believed his camera could be a weapon against poverty, racism and other social ills. Gilliard said he realized that, like Gordon Parks, he could serve his community with his camera. Schuerman said that what strikes him about Gilliard's photography is how much he enjoys simply being in the presence of the images. He said it's a socially relevant show. "It's about community," he said. "It's about Den-Zell's personal history, about things he's lived as an artist, as a youth growing up. And I guess I just think those stories, and the way he honors his community, is really interesting for all of us." Schuerman said the work is heartfelt. Gilliard agreed. "The key thing is you have to have good intent," he said. "And I have the good intent of showing the brightest light of the community. And that's what really makes people feel comfortable." "In the Company of Others" is on view at the Gordon Parks Gallery on the campus of Metropolitan State University through Feb. 21. A public reception will be held on Feb. 13 from 5 to 7 p.m.; the event was rescheduled from an earlier date because of a winter storm.